Deep cleaned interior -- dirt, mold, mildew, rust, bugs, sanded & painted with primer. Jacked up trailer to examine frame and axle. Cut out rotten entry floor and back bed floor, make stencils for new floor. Investigate removing shell from trailer. Wow! Amazing what some clean up & elbow grease will do for a FG camper! Great progress on your "Bug"! Great job on the exterior. I can't wait to see the insides done. I've gone down the rabbit hole much deeper than I had originally planned and I am a little overwhelmed by the scope of the project. That said, I am well on my way. The frame is with at a local trailer shop having a new axle welded on before it goes to be sandblasted. This leaves me with the shell suspended in my garage. There were about 20 screws holding the shell to the trailer in the Love Bug. 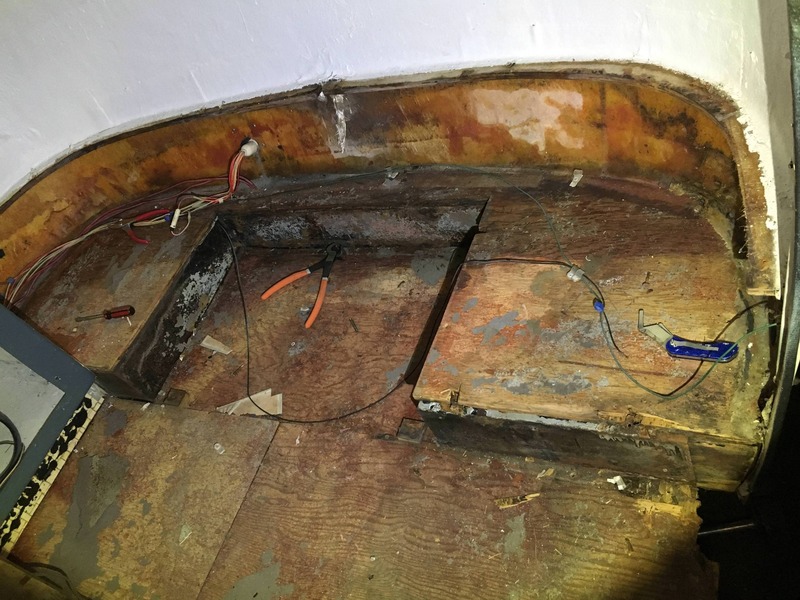 The four in the middle were buried underneath fiberglass and instead of cutting them out, I used a 5ft pry bar to pry the wood out over them. 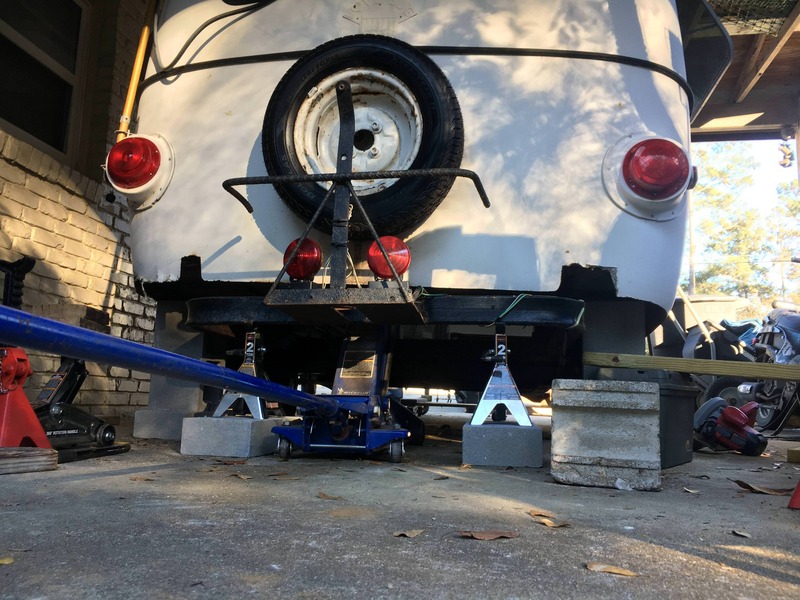 Through the careful use of floor jacks, jackstands, 2x4s and cinderblocks I was able to remove the trailer. Axle has been ordered and the trailer is now with a welder at a trailer shop who is installing the new axle before I take it to have sandblasted. 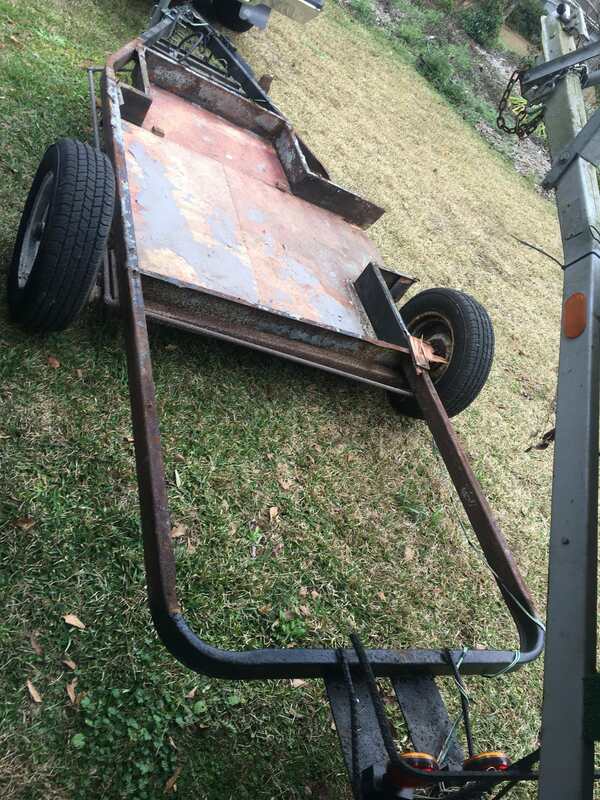 Trailer was in very good shape, much better than I expected to find. Dexter #9 axle is ordered, trailer has been sandblasted, primed and painted. Axle is still a few weeks out so I have been cleaning and sanding in preparation for patching holes in the hull and tabbing in a new floor. Working on embracing Dave's fiberglass wisdom and believing that I CAN DO IT! Hopefully that will get under way in the next week or two. Things are progressing albeit not as quickly as I would like. While I await the new axle, I have been doing a lot of sanding and cleaning in preparation for fiberglass body work. 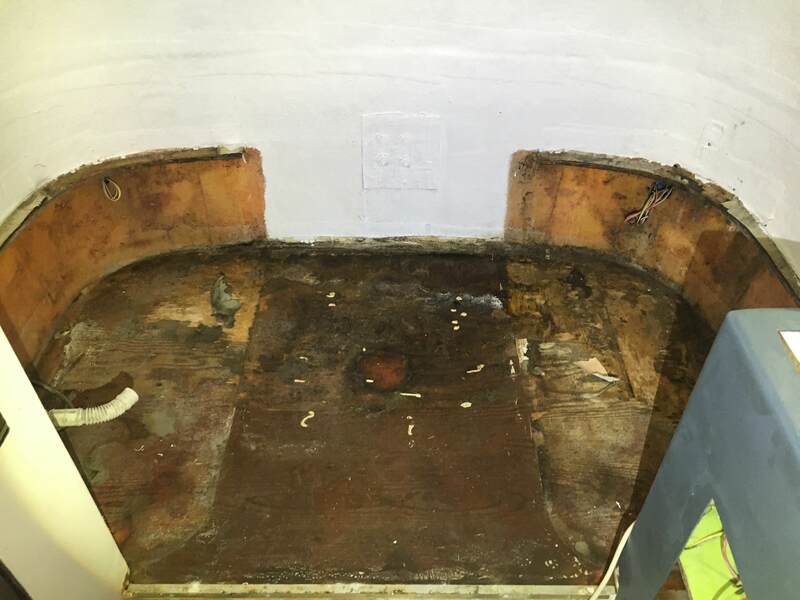 The biggest thing in the last 20 days has been getting the old floor out of the rear which was not too much trouble. Yesterday, I went to the local MakerSpace to learn about their new tool the x-carve which I am going to use for custom cabinet doors. I was excited to discover that Davie B from this Forum runs our MakerSpace. Two years ago, he did exactly what I am doing, so now I have a local person who has experience with all of this to bounce ideas off. I then notched vertically with jigsaw from below up to the lip and used an oscillating scrapper to remove the old wood up to the bottom of the fiberglass lip. This left the old lip in tact for the new floor to rest on. Used a refrigerator box from sears to create stencil for new floor. 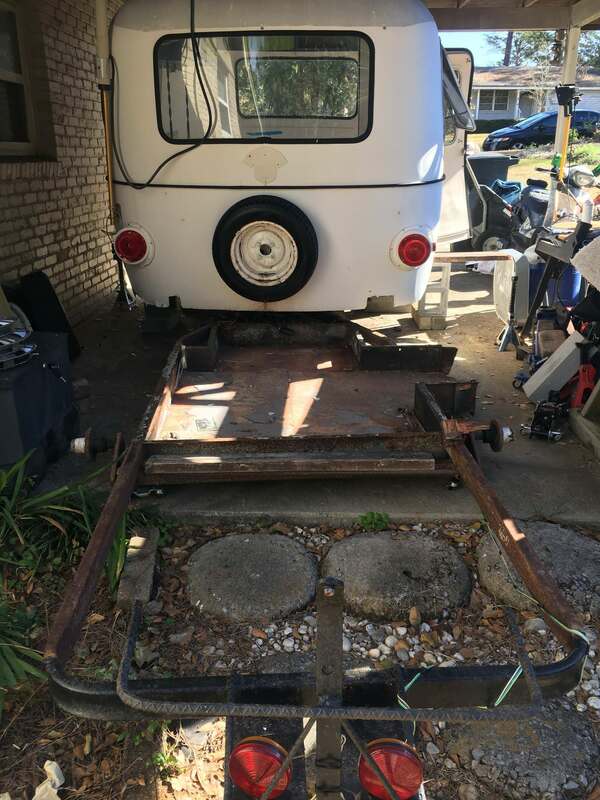 Track down marine ply (just found local supplier), seal new floor, glass in new floor, more fiberglass body work, hopefully axle will arrive soon and I can lower the shell back down. Nice work Rob. Thanks for sharing the details. Now I need to look up the X-carve. Way to go! I love seeing these wonderful vintage trailers getting the TLC they deserve! Great work - it looks amazing so far! Boy that axle was really done for. Its going to ride so much better now. All those bad smells will be gone and your going to really enjoy the trailer so much more. Looks really good Rob! I understand going down the rabbit hole. It can be fun though, as long as you get back out! I have to say I am jealous of your green grass and that you are working outside. While things have been warming up lately and all the snow had melted, we woke up to 4 or 5 inches of surprise snow this morning! Keep working, you are doing a great job. rob there are several of you pros on here I admire each one of you! Thanks, Tom! Those measurements helped. I may have one or two others to get from you once I get back underneath it. It certainly looks cold up there! I hope your wife had safe travels back from Apalach and that you are making good strides in your project. The new axle arrived yesterday and the trailer is at the welder today. The marine plywood should arrive next week. After a few weeks of slow going, things are starting to come together. Thank you everyone for your encouraging words and all of the support--this forum has been an invaluable resource. Target date for first camping trip is June 1, and so far, I am on schedule. I will check back in with the shell back on the trailer in a week or two.